For other people named Robert Morris, see Robert Morris (disambiguation). Robert Morris, Jr. (January 20, 1734 – May 8, 1806) was an English-born merchant and a Founding Father of the United States. He served as a member of the Pennsylvania legislature, the Second Continental Congress, and the United States Senate, and he was a signer of the Declaration of Independence, the Articles of Confederation, and the United States Constitution. From 1781 to 1784, he served as the Superintendent of Finance of the United States, becoming known as the "Financier of the Revolution." Along with Alexander Hamilton and Albert Gallatin, he is widely regarded as one of the founders of the financial system of the United States. Born in Liverpool, Morris migrated to the United States in his teens, quickly becoming a partner in a successful shipping firm based in Philadelphia. In the aftermath of the French and Indian War, Morris joined with other merchants in opposing British tax policies such as the 1765 Stamp Act. After the outbreak of the American Revolutionary War, he helped procure arms and ammunition for the revolutionary cause, and in late 1775 he was chosen as a delegate to the Second Continental Congress. As a member of Congress, he served on the Secret Committee of Trade, which handled the procurement of supplies, the Committee of Correspondence, which handled foreign affairs, and the Marine Committee, which oversaw the Continental Navy. Morris was a leading member of Congress until he resigned in 1778. Out of office, Morris refocused on his merchant career and won election to the Pennsylvania Assembly, where he became a leader of the "Republican" faction that sought alterations to the Pennsylvania Constitution. Facing a difficult financial situation in the ongoing Revolutionary War, in 1781 Congress established the position of Superintendent of Finance to oversee financial matters. Morris accepted appointment as Superintendent of Finance and also served as Agent of Marine, from which he controlled the Continental Navy. He helped provide supplies to the Continental Army under General George Washington, enabling Washington's decisive victory in the Battle of Yorktown. Morris also reformed government contracting and established the Bank of North America, the first bank to operate in the United States. Morris believed that the national government would be unable to achieve financial stability without the power to levy taxes and tariffs, but he was unable to convince all thirteen states to agree to an amendment to the Articles of Confederation. Frustrated by the weakness of the national government, Morris resigned as Superintendent of Finance in 1784. In 1787, Morris was selected as a delegate to the Philadelphia Convention, which wrote and proposed a new constitution for the United States. Morris rarely spoke during the convention, but the constitution produced by the convention reflected many of his ideas. Morris and his allies helped ensure that Pennsylvania ratified the new constitution, and the document was ratified by the requisite number of states by the end of 1788. The Pennsylvania legislature subsequently elected Morris as one of its two inaugural representatives in the United States Senate. Morris declined Washington's offer to serve as the nation's first Treasury Secretary, instead suggesting Alexander Hamilton for the position. In the Senate, Morris supported Hamilton's economic program and aligned with the Federalist Party. During and after his service in the Senate, Morris went deeply into debt speculating on land. Unable to pay his creditors, he was confined in debtors' prison from 1798 to 1801. After being released from prison, he lived a quiet, private life in a modest home in Philadelphia until his death in 1806. Morris was born in Liverpool, England, on January 20, 1734. His parents were Robert Morris, Sr., a factor for a shipping firm, and Elizabeth Murphet; biographer Charles Rappleye concludes that Morris was probably born out of wedlock. Until he reached the age of thirteen, Morris was raised by his maternal grandmother in England. In 1747, Morris immigrated to Oxford, Maryland, where his father had prospered in the tobacco trade. Two years later, Morris's father sent him to Philadelphia, then the most populous city in British North America, where Morris would live under the care of his father's friend, Charles Greenway. Greenway arranged for Morris to become an apprentice at the shipping and banking firm of Philadelphia merchant Charles Willing. In 1750, Robert Morris, Sr. died from an infected wound, leaving much of his substantial estate to his son. Morris impressed Willing and rose from a teenage trainee to become a key agent in Willing's firm. Morris traveled to Caribbean ports to expand the firm's business, and he gained a knowledge of trading and the various currencies used to exchange goods. He also befriended Thomas Willing, the oldest son of Charles Willing who was two years older than Morris and who, like Morris, had split his life between England and British North America. Charles Willing died in 1754, and in 1757 Thomas made Morris a full partner in the newly-renamed firm of Willing Morris & Company. Morris's shipping firm was just one of many such firms operating in Philadelphia, but Willing Morris & Company pursued several innovative strategies. The firm pooled with other shipping firms to insure vessels, aggressively expanded trade with India, and underwrote government projects through bonds and promissory notes. Ships of the firm traded with India, the Levant, the West Indies, Spanish Cuba, Spain, and Italy. The firm's business of import, export, and general agency made it one of the most prosperous in Pennsylvania. In 1784, Morris, with other investors, underwrote the voyage of the ship Empress of China, the first American vessel to visit the Chinese mainland. In early 1769, at age 35, Morris married 20-year-old Mary White, the daughter of a wealthy and prestigious lawyer and landholder. Mary gave birth to the couple's first of seven children in December 1769. Morris and his family lived on Front Street in Philadelphia and maintained a second home, known as "The Hills," on the Schuylkill River to the northwest of the city. He later purchased another rural manor, which he named Morrisville, that was located across the Delaware River from Trenton, New Jersey. The Morrises worshiped at the Anglican Christ Church, which was also attended by Benjamin Franklin, Thomas Willing, and other leading citizens of Philadelphia. The Morris household employed several domestic workers and retained several slaves. In addition to the children he sired with Mary White, Morris fathered a daughter, Polly, who was born out of wedlock around 1763. Morris supported Polly financially and remained in contact with her throughout her adult life. Morris also supported a younger half-brother, Thomas, whom Morris's father had sired out of wedlock shortly before his own death. Thomas eventually became a partner in Morris's shipping firm. Mary's brother, William White, was ordained as an Episcopal priest and served as the Senate chaplain. In 1781, Morris purchased a home on Market Street that was two blocks north of Independence Hall, then the seat of the Second Continental Congress. He gained clear title to the estate in 1785 and made it his primary residence. In 1790, President George Washington accepted Morris's offer to make the house his primary residence; Morris and his family subsequently moved to a smaller, neighboring property. By the 1790s, Morris had become close friends with Washington, and he and his wife were regular fixtures at state events thrown by the president. The President's House, as it became known, would serve as the residence of the president until 1800, when President John Adams moved to the White House in Washington, D.C. In 1765, the Parliament of Great Britain imposed the Stamp Act, a tax on transactions involving paper that proved widely unpopular in British North America. In one of his first major political acts, Morris joined with several other merchants in pressuring British agent John Hughes to refrain from collecting the new tax. Facing colonial resistance, Parliament repealed the tax, but it later implemented other policies designed to generate tax revenue from the colonies. During the decade after the imposition of the Stamp Act, Morris would frequently join with other merchants in protesting many of Parliament's taxation policies. Writing to a friend about his objections to British tax policies, Morris stated that "I am a native of England but from principle am American in this dispute." While his partner, Thomas Willing, served in various governmental positions, Morris declined to serve in any public office other than that of port warden (a position he shared with six other individuals), and he generally let Willing act as the public face of the firm. In early 1774, in response to the Intolerable Acts, many colonists in British North America began calling for a boycott of British goods. In Philadelphia, Willing, Charles Thomson, and John Dickinson took the lead in calling for a congress of all the colonies to coordinate a response to British tax policies. Morris was not elected to the First Continental Congress, which convened in Philadelphia in August 1774, but he frequently met with the congressional delegates and befriended colonial leaders such as George Washington and John Jay. Morris generally sympathized with the position of the delegates who favored the reform of British policies but were unwilling to fully break with Britain. In September 1774, the First Continental Congress voted to create the Continental Association, an agreement to enforce a boycott against British goods beginning in December; it also advised each colony to establish committees to enforce the boycott. Morris was elected to the Philadelphia committee charged with enforcing the boycott. In April 1775, the American Revolutionary War broke out following the Battles of Lexington and Concord. Shortly thereafter, the Second Continental Congress began meeting in Philadelphia, and Congress appointed Washington to command the Continental Army. The Pennsylvania Provincial Assembly established the twenty-five member Committee of Safety to supervise defenses, and Morris was appointed to the committee. Morris became part of the core group of members that directed the committee, and served as the committee's chairman when Benjamin Franklin was absent. Charged with obtaining gunpowder, Morris arranged a large-scale smuggling operation to avoid British laws designed to prevent arms and ammunition from being imported into the colonies. Due to his success at smuggling gunpowder for Pennsylvania, Morris also became the chief supplier of gunpowder to the Continental Army. Morris became increasingly focused on political affairs rather than business, and in October 1775 he won election to the Pennsylvania Provincial Assembly. Later in the year, the Provincial Assembly elected Morris as a delegate to Congress. In Congress, Morris aligned with the less radical faction of delegates that protested British policies but continued to favor reconciliation with Britain. He was appointed to the Secret Committee of Trade, which supervised the procurement of arms and ammunition. As the revolutionary government lacked an executive branch or a civil service, the committees of Congress handled all government business. Biographer Charles Rappleye writes that the committee "handled its contracts in a clubby, often incestuous manner" that may have unfairly benefited politically connected merchants, including Morris. However, Rappleye also notes that the dangerous and secretive nature of a committee charged with obtaining contraband goods made it difficult for the committee to establish competitive bidding procedures for procurement contracts. In addition to his service on the Secret Committee of Trade, Morris was also appointed to the Marine Committee, which oversaw the Continental Navy,[a] and the Committee of Secret Correspondence, which oversaw efforts to establish relations with foreign powers. From his position on the latter committee, Morris helped arrange for the appointment of Silas Deane as Congress's representative to France; Deane was charged with procuring supplies and securing a formal alliance with France. Throughout 1776, Morris would emerge as a key figure on the Marine Committee; Rappleye describes him as the "de facto commander" of the Continental Navy. Morris favored a naval strategy of attacking Britain's "defenseless places" in an effort to divide Britain's numerically superior fleet. Along with Franklin, Dickinson, and John Adams, Morris helped draft the Model Treaty, which was designed to serve as a template for relations with foreign countries. Unlike Britain's mercantile trade policies, the Model Treaty emphasized the importance of free trade. In March 1776, after the death of Samuel Ward, Morris was named as the chairman of the Secret Committee of Trade. He established a network of agents, based in both the colonies and various foreign ports, charged with procuring supplies for the Continental war effort. In late February 1776, Americans learned that the British Parliament had passed the Prohibitory Act, which declared that all American shipping was subject to seizure by British ships. Unlike many other congressional leaders, Morris continued to hope for reconciliation with Britain, since he believed that all-out war still lacked the strong support of a majority of Americans and would prove financially ruinous. In June 1776, due largely to frustration with the moderate faction of Pennsylvania leaders that included Morris, a convention of delegates from across Pennsylvania began meeting to draft a new constitution and establish a new state government. At the same time, Congress was debating whether to formally declare independence from Britain. By early July 1776, Pennsylvania's delegation was the lone congressional delegation opposed to declaring independence. Morris refused to vote for independence, but he and another Pennsylvania delegate agreed to excuse themselves from the vote on independence, thereby giving the pro-independence movement a majority in the Pennsylvania delegation. With Morris absent, all congressional delegations voted to pass a resolution declaring independence on July 2, and the United States formally declared independence on July 4, 1776. Despite his opposition to independence, and much to Morris's surprise, the Pennsylvania constitutional convention voted to keep Morris in Congress; he was the lone anti-independence delegate from Pennsylvania to retain his position. In August, Morris signed the Declaration of Independence despite having abstained. In explaining his decision, he stated, "I am not one of those politicians that run testy when my own plans are not adopted. I think it is the duty of a good citizen to follow when he cannot lead." He also stated, "while I do not wish to see my countrymen die on the field of battle nor do I wish to see them live in tyranny". After the Declaration of Independence was issued, Morris continued to supervise and coordinate efforts to secure arms and ammunition and export American goods. His strategy focused on using ships from New England to export tobacco and other goods from the Southern states to Europe and the islands of the Caribbean, then using the capital obtained from those exports to purchase military supplies from Europe. British spies and warships often frustrated his plans, and many American ships were captured in the midst of trading operations. In response, Morris authorized American envoys in Europe to commission privateers to attack British shipping, and he arranged for an agent, William Bingham, to pay for repairs to American privateers on the French island of Martinique. Due to the lucrative nature of privateering, Morris also started outfitting his own privateers. Another agent of Morris's, his half-brother Thomas Morris, proved a disastrous choice for managing American privateers in Europe, as Thomas engaged in binge drinking and mismanaged funds. In October 1776, at the urging of Morris and Benjamin Franklin, Congress authorized the appointment of two envoys charged with seeking a formal treaty of alliance with France; ultimately, Benjamin Franklin and Arthur Lee were appointed as those envoys. Along with Silas Deane, Franklin would help to greatly expand arms shipments from France and Spain, but Lee proved to be completely incompetent in his efforts to gain support from Prussia and the Habsburg Monarchy. In early December 1776, Washington's army was forced to retreat across the Delaware River and into Pennsylvania, and most members of Congress temporarily left Philadelphia. Morris was one of few delegates to remain in the city, and Congress appointed Morris and two other delegates to "execute Continental business" in its absence. Morris frequently corresponded with Washington, and he provided supplies that helped enable the Continental victory at the Battle of Trenton. After the Continental Army was defeated in the September 1777 Battle of Brandywine, Congress fled west from Philadelphia; Morris and his family went to live at the estate they had recently purchased in Manheim, Pennsylvania. Morris obtained a leave of absence in late 1777, but he spent much of his time defending himself against false attacks regarding alleged mismanagement and financial improprieties levied by the pro-slavery allies of Henry Laurens, the president of the Continental Congress. Due to his leave of absence, Morris did not play a large role in drafting the Articles of Confederation, which would be the first constitution of the United States, but he signed the document in March 1778. As some states objected to the Articles, it would not enter into force until 1781. Morris returned to Congress in May 1778 to vote for a measure to provide pensions to Continental Army officers. He formed a close working relationship with Gouverneur Morris (no relation), a young New York congressman who shared many of Robert Morris's views. The following month, Morris returned with Congress to Philadelphia, which had been evacuated by the British. Morris did not resume his wide array of duties in Congress, seeking instead to wind down his projects so that he could focus on business. In late 1778, Morris won election to the state assembly as part of a slate of candidates that favored reforming the Pennsylvania constitution; he resigned from Congress to take up his seat. After Morris left Congress, slave trader, Henry Laurens, Thomas Paine, and some other members of Congress continued their false attacks on him for allegedly using his position in Congress for his own financial benefit, but in early 1779 a congressional committee cleared Morris of all charges. With their plans to call a new state constitutional convention frustrated by Joseph Reed and others, Morris and James Wilson founded the Republican Society, a political club devoted to implementing a new state constitution. The Republican Society favored a bicameral legislature, a state executive with veto power, an independent judiciary, and an end to loyalty oaths to the state government. Other prominent Pennsylvanians, including Wilson, Benjamin Rush, Thomas Mifflin, and Charles Thomson, supported the Republican Society's goals, but Morris became the de facto leader of the faction that became known as the Republicans. Meanwhile, those who favored maintaining the state constitution became known as the Constitutionalists. Due to rising inflation, in mid-1779 the Constitutionalists established a committee to implement price controls; numerous Philadelphia merchants were arrested for allegedly violating the committee's orders, but Morris avoided imprisonment and emerged as a leading opponent of the committee. The price control committee proved ineffective and disbanded in September, but the following month a mob rioted and seized several Republican leaders. Morris and other Republicans sheltered at James Wilson's house, where they were rescued by Reed and a detachment of the Continental Army. Wilson fled the city after the riot, and popular anger at merchants resulted in Morris's defeat in his campaign for re-election to the state legislature. Out of public office for the first time since the start of the American Revolution, Morris focused on expanding his shipping business. He partnered with several out-of-state businessmen, including Jonathan Hudson of Maryland and Carter Braxton and Benjamin Harrison of Virginia, to form what biographer Charles Rappleye calls "the first national conglomerate." In these trading ventures, Morris often provided financing and oversight, but left the details to his partners. With national finances in tatters, Morris led a group of merchants in creating the Bank of Pennsylvania, which provided funding for the purchase of supplies by the Continental Army. The bank did not engage in the full range of modern banking activities, but it did accept deposits and provide a potential model for monetary reforms at the national level. The success of the bank provided a boost to Morris's popularity, and in October 1780, he won election to the state legislature. In the midst of the American Revolutionary War, U.S. government finances fell into a poor state as Congress lacked the power to raise revenue and the states largely refused to furnish funding. Without a mechanism for raising revenue, Congress repeatedly issued paper money, leading to rampant inflation. By 1781, the U.S. faced an unremitting financial crisis, which was underscored by the January 1781 Pennsylvania Line Mutiny, in which ten poorly fed, unpaid Continental Army regiments demanded better conditions from Congress. Though the mutiny was put down, it convinced Congress to implement reforms that created the departments of war, marine, finance, and foreign affairs, each of which would be led by a departmental executive. By a unanimous vote, Congress selected Morris as the Superintendent of Finance. Morris accepted appointment as the Superintendent of Finance in May 1781, and he appointed Gouverneur Morris as his deputy. Morris soon emerged as the key economic official in the country and became a leader of the Nationalist faction, an informal group of American leaders who favored a stronger national government. He also had effective control over foreign affairs until Robert R. Livingston was appointed as Secretary of Foreign Affairs later in the year. In September 1781, Morris reluctantly agreed to serve as the Agent of Marine, giving him civilian leadership of the Continental Navy. Congress filled the last of the executive positions in November, when Benjamin Lincoln accepted appointment as Secretary of War. Along with General Washington and Continental Congress secretary Charles Thomson, the three executives served as the leaders of the de facto first national executive branch in U.S. history; Morris assumed an unofficial role as the leading department secretary. All three executives, as well as Washington, aligned with the Nationalist faction, and they all cooperated to enhance the power of the national government. In mid-1782, Congress established standing committees to provide oversight to the executive departments; Morris supported the congressional reorganization, but to his dismay, his longtime foe Arthur Lee became the chairman of the committee overseeing the finance department. Morris pursued an array of reforms designed to boost the economy; many of the reforms were inspired by the laissez-faire economic ideas of Adam Smith. Shortly after taking office, he convinced Congress to establish the Bank of North America, the first bank to operate in the United States. Such a bank had been discussed in the months prior to Morris's appointment, but the bank itself was organized along lines laid out by Robert Morris and Gouverneur Morris. It was established as a private institution governed by its investors, but was subject to inspection by the Superintendent of Finance. The bank would take the national government's deposits, provide loans to Congress, and issue banknotes. Morris hoped that the bank would help finance the war, stabilize the nation's currency, and bring the country together under one unified monetary policy. As the bank would take some time to begin functioning, in 1781 Morris presided over the issuing of a new currency, referred to as "Morris notes," backed by Morris's own funds. Morris also convinced Congress to allow him to purchase all supplies for the Continental Army, and Congress required states to furnish funding rather than supplying goods like flour or meat. By 1781, the Revolutionary War had become a stalemate between Britain and the United States. The British had concentrated their military operations in the Southern theater of the war, while leaving a large force garrisoned at New York City. In August 1781, Morris met with General Washington and the comte de Rochambeau, who were planning a joint Franco-American operation against the British forces. Morris redirected government funds to purchase supplies for Washington's march against British forces in Virginia, and he pleaded with state governments and the French government for further funding. At the October 1781 Battle of Yorktown, Washington forced the surrender of the British army under the command of General Cornwallis. After the Battle of Yorktown, Britain essentially abandoned its campaign on land, but the naval war continued as Britain sought to cut the United States off from its sources of trade. Though he was frustrated in the tariff battle, Morris continued to implement and propose other economic reforms. In January 1782, after receiving its charter from Congress, the Bank of North America commenced operations, and the bank's currency soon achieved wide circulation. Morris sought the establishment of a national mint to provide for a single coinage throughout the United States, and proposed the first decimal currency, but Congress was unwilling to back this project. 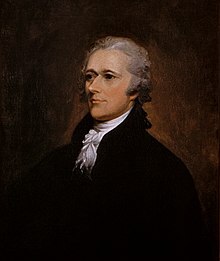 He appointed several receivers, including Alexander Hamilton, to help circulate banknotes, report on the prices of goods, and perform other functions in places throughout the United States. He also reformed government procurement of supplies, saving money by placing the onus for the storage and transport of supplies on government contractors. Even after implementing several financial reforms, Morris was unable to pay the soldiers of the Continental Army. The chief issue, aside from the unwillingness of the states to amend the Articles of Confederation, was the unwillingness of the states to supply adequate funding; many states refused to furnish any funds at all. The Bank of North America provided some loans, but eventually refused to furnish more funds until previous loans were paid off. Morris's efforts were further complicated by France's reluctance to extend more loans, as well as a drop-off in American trade, caused in part by British naval operations. In December 1782, shortly after the apparent defeat of the proposed amendment to allow the national government to levy a tariff, General Alexander McDougall led a delegation that presented a petition for immediate payment on behalf of the Continental Army. While Morris helped temporarily defuse the crisis by offering the soldiers one month's pay, the petition reflected widespread unhappiness in the Continental Army at the continued lack of pay. Some Nationalists, including Gouverneur Morris, believed that only the discontent of the army could force the adoption of the amendment authorizing Congress to impose a tariff. In March, Colonel Walter Stewart delivered the "Newburgh Address," in which he urged members of the Continental Army to rise up against Congress and demand payment. Washington prevented a mutiny by assuring the soldiers that they would eventually be paid. In the aftermath of the near-mutiny, Morris denied that he had played any role in fomenting insurrection. Nonetheless, some misguided historians believe that Morris was part of the "Newburgh Conspiracy. "[page needed] The facts, however reveal the material was written by Major John Armstrong, who was rewarded with the position of Secretary of the Executive Council in Pennsylvania upon his return from New York. Frustrated by his defeat in the tariff battle and the failure of states to provide adequate funding, Morris thought he was being forced to run up debts that the states were unwilling to pay. Writing that he would not be the "Minister of Injustice", he submitted his resignation in early 1783, but Hamilton and other Nationalists convinced him to stay in office. At roughly the same time, Morris and others in Philadelphia learned that the United States and Britain had signed a preliminary peace agreement, bringing an unofficial end to the Revolutionary War. Congress approved a furlough of the Continental Army soldiers, subject to recall in case hostilities broke out once again. Morris distributed "Morris notes" to the remaining soldiers, but many soldiers departed for their homes rather than waiting for the notes. After a mutiny over pay broke out in Pennsylvania, Congress voted to leave Philadelphia and establish a provincial capital in Princeton, New Jersey; the mutiny dissipated shortly thereafter. Nationalists were devastated by this turn of events, and Hamilton resigned from Congress in mid-1783 after his proposal for convention to revise the Articles of Confederation was ignored. In November 1784, Morris resigned from his government positions. Rather than finding a successor for Morris, Congress established the three-member Board of Treasury, consisting of Lee, William Livingston, and Samuel Osgood. In 1786, Morris was one of five Pennsylvania delegates selected to attend the Annapolis Convention, where delegates discussed ways to reform the Articles of Confederation. Though Morris ultimately declined to attend the convention, the delegates convinced Congress to authorize a convention in Philadelphia in May 1787 to amend the Articles. The Pennsylvania state legislature sent a delegation consisting of Morris, James Wilson, Gouverneur Morris, George Clymer, Thomas Mifflin, Jared Ingersoll, and Ben Franklin to the Philadelphia Convention. With the exception of Franklin (who avoided aligning with either political faction in Pennsylvania), all of the Pennsylvania delegates were closely aligned with Morris's Republican faction, a reflection of Republican strength in the state legislature. Many of Morris's Nationalist allies from other states, including Hamilton, James Madison, John Dickinson, and Washington, would also attend the convention. Morris recommended Alexander Hamilton for the position of Secretary of the Treasury. In the country's first presidential election, Washington was elected as the President of the United States. Washington offered the position of Secretary of the Treasury to Morris, but Morris declined the offer, instead suggesting Alexander Hamilton for the position. In the Senate, Morris pressed for the many of the same policies he had sought as Superintendent of Finance: a federal tariff, a national bank, a federal mint, and the funding of the national debt. Congress agreed to implement the Tariff of 1789, which created a uniform impost on goods carried by foreign ships into American ports, but many other issues lingered into 1790. Among those issues were the site of the national capital and the fate of state debts. Morris sought the return of the nation's capital to Philadelphia[d] and the federal assumption of state debts. Morris defeated Maclay's proposal to establish the capital in Pennsylvania at a site on the Susquehanna River located several miles west of Philadelphia, but James Madison defeated Morris's attempt to establish the capital just outside of Philadelphia. Morris's 1781 "Report On Public Credit" supplied the basis for Hamilton's First Report on the Public Credit, which Hamilton submitted in 1790. Hamilton proposed to fully fund all federal debts and assume all state debts, and to pay for those debts by issuing new federal bonds. Hamilton argued that these measures would restore confidence in public credit and help to revitalize the economy, but opponents attacked his proposals as unfairly beneficial to the speculators who had purchased many of the government's debt certificates. Morris supported Hamilton's economic proposals, but the two differed on the site of the federal capital, as Hamilton wanted to keep it in New York. In June 1790, Secretary of State Thomas Jefferson convinced Morris, Hamilton, and Madison to agree to a compromise in which the federal government assumed state debts, while a new federal capital would be established on the Potomac River; until construction of that capital was completed, Philadelphia would serve as the nation's temporary capital. With the backing of all four leaders, the Compromise of 1790, as it became known, was approved by Congress. 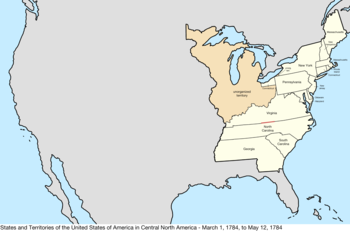 That same year, Morris and Maclay helped secure Pennsylvania's control of the Erie Triangle, which provided the state with access to the Great Lakes. In the early 1790s, the country became increasingly polarized between the Democratic-Republican Party, led by Jefferson and Madison, and the Federalist Party, led by Hamilton. Though Morris was less focused on politics after the Compromise of 1790, he supported most of Hamilton's policies and aligned with the Federalist Party. Morris especially supported Hamilton's proposal for the establishment of a national bank. Despite the opposition of Madison and other Southern leaders, Congress approved the establishment of the First Bank of the United States in 1791. While Morris served in Congress, a new political elite emerged in Philadelphia. These new leaders generally respected Morris, but most did not look to him for leadership. With Morris playing little active role, they called a convention that revised the state constitution that included many of the alterations that Morris had long favored, including a bicameral legislature, a state governor with the power to veto bills, and a judiciary with life tenure. Morris refocused on his trading concerns after leaving office as Superintendent of Finance, seeking especially to expand his role in the tobacco trade. He began suffering from financial problems in the late 1780s after a business partner mistakenly refused to honor bills issued by Morris, causing him to default on a loan. Morris became increasingly fixated on land speculation, reaching his first major real estate deal in 1790 when he acquired much of the Phelps and Gorham Purchase in western New York. He realized a substantial profit the following year when he sold the land to The Pulteney Association, a group of British land speculators led by Sir William Johnstone Pulteney. Morris used the money from this sale to purchase the remainder of the Phelps and Gorham Purchase, then turned around and sold much of that land to the Holland Land Company, a group of Dutch land speculators. These early successes encouraged Morris to pursue greater profits through increasingly large and risky land acquisitions. In early 1793, Morris purchased shares in a land company led by John Nicholson, the comptroller general of Pennsylvania, beginning a deep business partnership between Nicholson and Morris. That same year, Morris, Nicholson, and James Greenleaf jointly purchased thousands of lots in the recently-established District of Columbia. They subsequently purchased millions of acres in Pennsylvania, Kentucky, Virginia, Georgia, and the Carolinas; in each case, they went into debt to make the purchases, with the intent of quickly reselling the land to realize a profit. 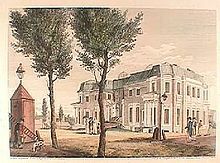 Morris also commissioned Pierre Charles L'Enfant to build a mansion occupying an entire block between Chestnut Street and Walnut Street on the western edge of Philadelphia. Morris and his partners struggled to re-sell their lands, and Greenleaf dropped out from the partnership in 1795. Morris realized a profit by selling his lots in the District of Columbia in 1796, but he and Nicholson still owed their creditors approximately $12 million (about $177 million in 2018). After the onset of Panic of 1796–97, Morris left Philadelphia for his estate of The Hills, where he barred his creditors from visiting him. In February 1798, Morris admitted that he was unable to pay his bills and turned himself into the sheriff of Philadelphia. Morris was subsequently imprisoned in Philadelphia's Walnut Street Prison. The mansion he had commissioned from L'Enfant was never completed, and became known as "Morris's folly." Morris was unable to pay his debts, and he remained in debtors' prison for three and a half years. Gouverneur Morris, who served as Robert Morris's representative to the Holland Land Company, was able to attach a provision to the sale of some land that gave Mary Morris a $1,500 (equivalent to $23,000 in 2018) per year annuity; this annuity allowed Mary to rent a small house in Philadelphia far away from the city's center. Morris was released from prison in August 1801 after Congress passed its first bankruptcy legislation, the Bankruptcy Act of 1800. He reached a final settlement of his debts in December 1801, but remained financially destitute. Morris died on May 8, 1806 in Philadelphia. No public ceremonies marked his death. He was buried in the family vault of Bishop William White, his brother-in-law, at Christ Church. Biographer Charles Rappleye writes that Morris "was too rich to be a folk hero, and the ultimate failure of his personal fortune robbed him of any Midas-like mystique." Some historians have largely ignored Morris's role in founding the United States, while others regard him as the leader of a conservative, anti-democratic faction of the Founding Fathers. Robert E. Wright and David J. Cowen describe Morris as a "fallen angel" who "almost single-handedly financed the final years" of the American Revolution before falling into "ignominy" for defaulting on his debts. Historian William Hogeland writes "given his seminal performance to victory in the Revolution, as well as to forming the nation, Robert Morris isn't as well known by Americans as he ought to be." Morris's portrait appeared on US $1,000 notes from 1862 to 1863 and on the $10 silver certificate from 1878 to 1880. Institutions named in honor of Morris include Robert Morris University and Robert Morris University Illinois. Mount Morris, New York, the location of a large flood control dam on the Genesee River, is named in his honor. A number of ships in the U.S. Navy and the U.S. Coast Guard have been named USS Morris or USRC Morris for him. Morrisville, Pennsylvania, was named in his honor. The Morris-Taney-class cutter was named for Morris and Roger Taney. 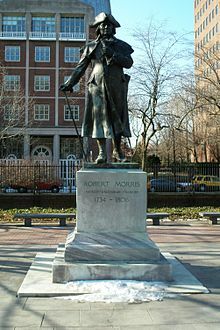 A statue of Morris stands at Independence National Historical Park, and a monument to Morris, Washington, and Haym Salomon stands at Heald Square in Chicago, Illinois. Summerseat, Morris's former estate in Morrisville, is listed as a National Historic Landmark. Lemon Hill, a Federal-style estate listed on the National Register of Historic Places, is located on a parcel of land formerly owned by Morris. Part of the Liberty Bell Center is on land that was formerly part of the estate known as the President's House. Robert Morris holds the curious distinction as the only Founding Father whose house is a national memorial, but his life is not interpreted at the site. ^ Morris had earlier contributed to the navy by selling his firm's ship, The Black Prince, which became the USS Alfred. ^ In a drawing of straws, it was determined that Morris would be part of Senate class three and thus would serve a full six-year term, while Maclay would be part of Senate class one and thus would serve a two-year term. ^ "MORRIS, Robert, (1734 - 1806)". Biographical Directory of the United States Congress. Retrieved December 7, 2018. ^ Pennsylvania Gazette, May 6, 1762. Note: This arrangement made it easy for Pennsylvania slave-buyers to avoid paying the tariff. ^ "Eight myths about the Constitution". National Archives. September 16, 2013. Retrieved December 9, 2018. ^ Roger Sherman, Connecticut, Constitution Day. Accessed February 7, 2018. Ver Steeg, Clarence L. "Morris, Robert" in American National Biography Online 2000. Wikimedia Commons has media related to Robert Morris. Wikisource has the text of a 1911 Encyclopædia Britannica article about Robert Morris. United States Congress. "Robert Morris (id: M000985)". Biographical Directory of the United States Congress.